OAKLAND, Calif. (AP) With April approaching, the beat-up, undermanned Golden State Warriors are prioritizing health over everything else – even the No. 1 seed in the West. Yet the faces down are glaring: NBA Finals MVP Kevin Durant, two-time MVP Stephen Curry and his Splash Brother, Klay Thompson. 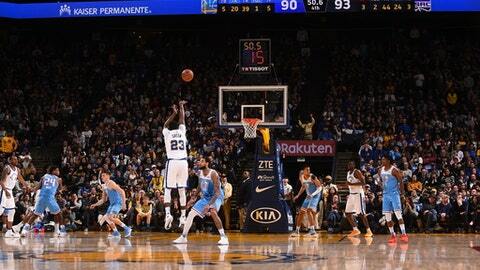 Buddy Hield made three free throws over the final 27.5 seconds, Willie Cauley-Stein had a late dunk and the Sacramento Kings won for the second time this season on Golden State’s home floor, beating a Warriors team missing its top three scorers 98-93 on Friday night. Hield finished with 22 points off the bench. He also had seven assists and seven rebounds. Quinn Cook scored a career-high 25 points on 10-for-13 shooting for Golden State (52-17), making his initial seven shots and also hitting a career-best five 3-pointers after the team announced Durant was out with a broken rib. Green returned from a one-game injury absence to produce 14 points, 10 rebounds, seven assists, four steals and two blocked shots. ”That’s the most important thing, though, is to get healthy,” Green said. ”Obviously I think where we are right now we’re in the position where I think all three guys could play if they had to but it’s just not that important for them to play. I think it’s more important for them to be healthy. That’s kind of been the theme the whole year, just to keep guys fresh and healthy and try to get a rhythm. Hield made one free throw with 27.5 seconds left and then two more with 13.2 seconds remaining as the Kings (23-47) withstood a frantic final minute after the teams entered the fourth quarter tied at 75. Sacramento also won at Oracle Arena on Nov. 27. Before the game, NBA Finals MVP Durant became the latest Warriors star to go down . Then Golden State lost reserve Omri Casspi to an ankle injury early in the game. Durant will miss at least two weeks with a fractured rib on the right side. An MRI exam revealed Durant’s injury, and he will be re-evaluated in two weeks. Durant said there’s still time for the team to heal and get ready for the playoffs. He missed 18 games in 2017 before returning for the final two contests of the regular season. Cook scored 13 in the first quarter as the Warriors jumped out to a nice lead, but they held just a 59-57 edge at halftime. Both teams played the first of back-to-back games. Kings: The Kings shot 14 for 31 from 3-point range and held a 47-40 rebounding advantage. … Kosta Koufos, who had 12 rebounds, was hit with a technical early in the second. Warriors: Casspi limped off at the 9-minute mark of the second with a sprained right ankle. … Curry missed his fourth straight game after re-injuring his troublesome right ankle. He will be re-evaluated Tuesday, while Thompson has a fractured right thumb and will be examined again next Thursday. … Green became the eighth player in franchise history with 500 or more blocked shots. In a sweet pregame moment, Kerr brought up Champ Pederson on Warriors special needs night to help with the pregame media session before Pederson announced the starting lineups. Champ is 30 and has Down syndrome. He has worked part-time as a finance assistant for the Warriors since last fall and is the big brother of Dodgers outfielder Joc Pederson. ”He could be in the lineup,” Kerr joked. Kings: At Utah on Saturday. Warriors: At Phoenix on Saturday.